I looked at the calendar yesterday morning and did a double-take..."whaddya mean it's February 12th? How did THAT happen?" 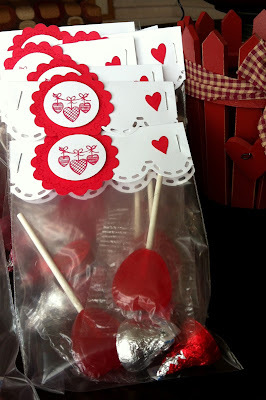 Well, I guess I've so been busy doing other projects (a few scrapbook layouts, which I'll share soon, and a major sort job on three Rubbermaid bins of photos from my parents house) that I hadn't even noticed V-Day was creeping up - yikes! After seeing the date, I knew I better get my craft in gear and figure out something for the boys to take to school for their classmates. 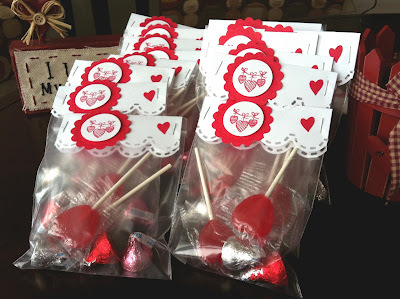 I made a quick trip to the local drug store and purchased Valentine Hershey Kisses and some Heart shaped lollipops to create treat baggies with toppers. Hey... not the most original idea, but I figured I could make 'em cute. 1) Measure your baggies to determine the size of your topper. My bags were 4" across the top and I wanted about a 1.5" fold after the border was punched, so I trimmed and used a piece of 4" x 4" white paper for each baggie. 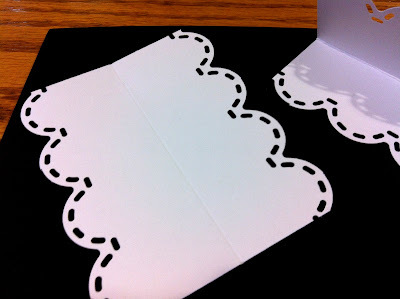 2) Use the Border Maker System and the Scallop Stitch cartridge to punch a decorative edge on both sides of the paper. Score in the middle to fold over top of the baggie. 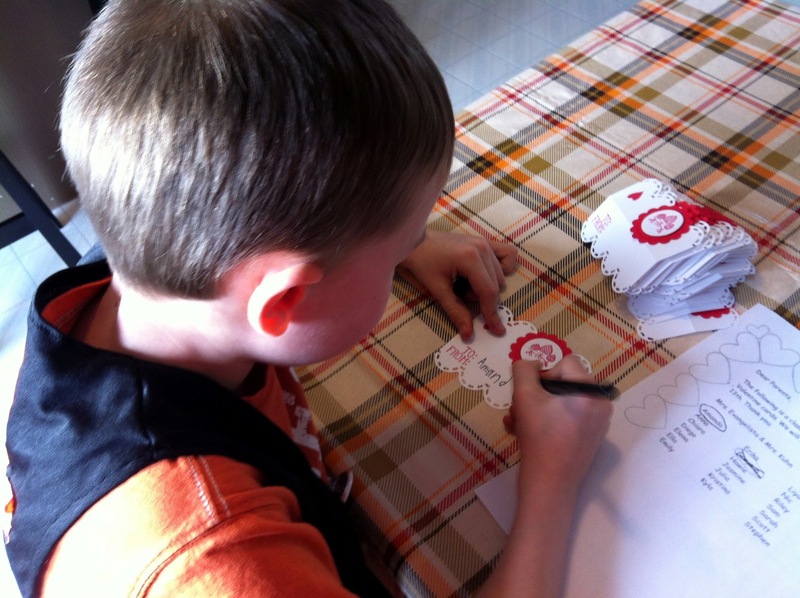 3) Punch a Scallop circle from red cardstock. 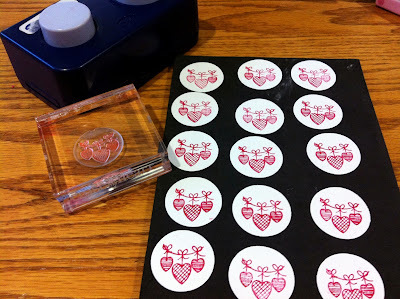 Stamp a ring of hearts using a stamping block and red ink ("Real Red" from Stampin' Up) onto the scalloped circle. 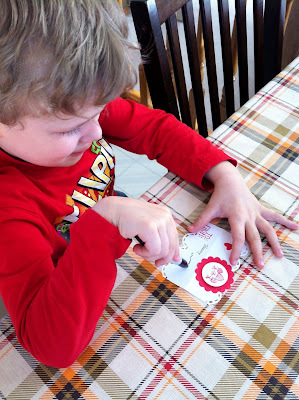 4) Punch a circle from white cardstock. 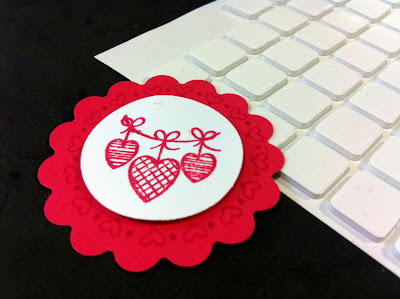 Stamp a heart image or saying on the white circle. 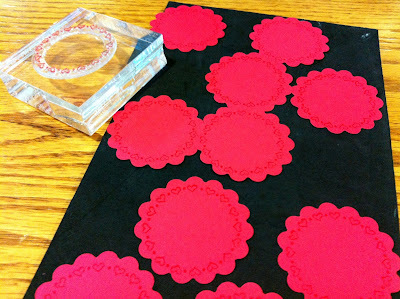 5) Layer the white circle onto the red scallop circle using a foam square for a little pop. Set aside. 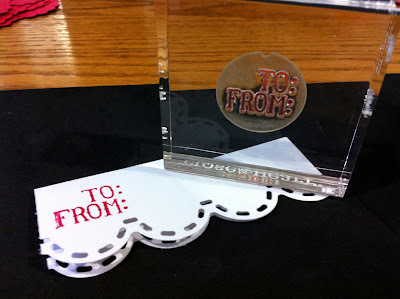 6) Fold your topper along the scored line and turn it over. 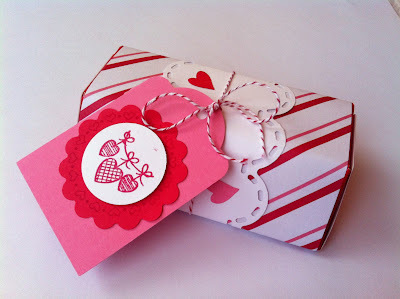 Use a To/From stamp or simply write To/From on the back side. 7) Turn the topper over to decorate the front. Adhere one of the layered scalloped shapes to the left hand side, lining up with one of the border scallops. 10) Fold the finished topper over the top edge of the filled baggies and staple in place. If you have lots of Valentine's to make its easiest to do them in assembly line fashion....cut all the white paper strips, then punch all the paper strips, then fold all the paper strips etc. If you do each step separately, you'll find it will take much longer. Once I decided on my design it took about an hour and 10 minutes to get 35 of these cut and assembled, then 15 minutes more when the boys came home from school to finish them off with names etc. 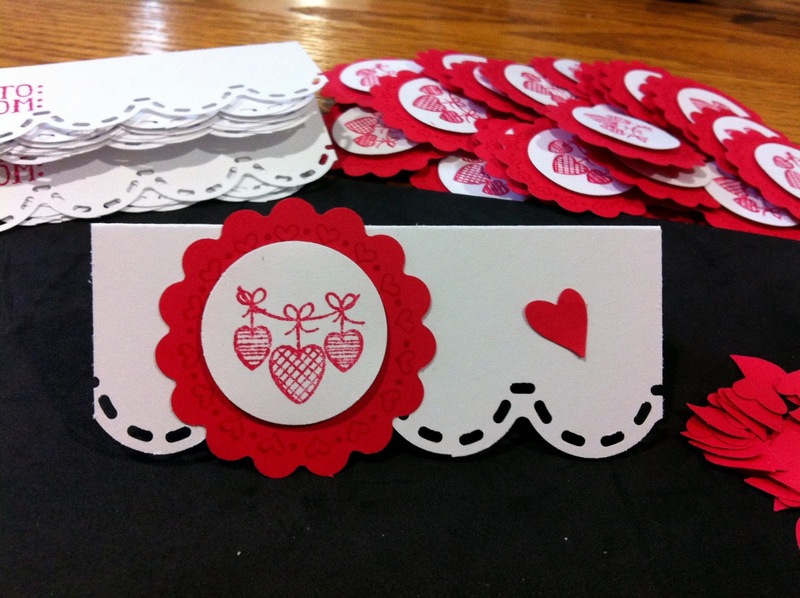 I'm glad to be done just in time, but next year I'm putting "making school Valentines" on the calendar in January! If you're like me and have left it to the last minute...trust me, there's still time to whip up something sweet in time for tomorrow!